admin February 13, 2018	 February 13, 2018 From the "Rovers"
In 2015, my students and I embarked on a journey to learn about ocean biomes, ocean animals and animal adaptations. After an in-depth project-based learning (PBL) unit covering these concepts, my students had the question: How do we explore the ocean? This question was timed with our trip to see the premiere of James Cameron’s film, “Deepsea Challenge 3D”, which followed Cameron’s journey in building a human-operated underwater vehicle (HOV) to explore the Mariana Trench. Armed with this curiosity, students wondered if we could build remotely operated vehicles, or ROVs, to help us learn how scientists explore the ocean. After brainstorming with a local marine scientist, Dr. Mikki, I researched underwater ROVs and various ways students could build their own. Luckily, we happened to have a few SeaPerch ROV kits at our school, just waiting to be unpacked and built. With that conversation began what has now become an ongoing STEM project in collaboration with Ocean First Institute and Ocean First Education, Explore ROV (since renamed Project ROV). Sea Perch in action (photo: Caine Delacy, Ocean First Education). In year one, my students and I, joined by excited parents, engineering student volunteers, middle school mentors, and marine scientists, built and tested SeaPerch ROVs. A 3-day building process taught students the importance of measuring, collaboration, redesigning, problem solving, and reading and following directions. After students built, tested, and refined their ROV designs, they began the process of designing a series of maneuverability challenges for our pool competition. Each team was tasked with designing a challenge that all teams would put their ROVs through such as maneuvering through underwater hula hoops, or racing to the end of the pool and back. In our final competition event, each team would compete in the challenges and earn points. This was a fun-filled event, as students worked as teams to maneuver their ROVs, and fix problems on the spot. The maneuverability of the ROVs was important, as the winning ROV to come with me on my research trip to Kodiak, Alaska, where I was a NOAA Teacher at Sea on board the ship Oscar Dyson. The ROV was deployed near our ship in the waters surrounding Kodiak Island, giving students a chance to see the underwater environment, including critters such as jellies and fish. How do ROVs collect data for scientists? Using 3D modeling software, students were tasked with creating an attachment for their ROV that would collect data necessary for scientists. What kind of data do scientists need the ROVs to collect? Students found that scientists needed ROVs to help them collect samples of water, sediment, and sometimes even critters that were found in specific areas. Armed with 3D printing software and a 3D printer, the students created prototypes for ROV attachments. These ROVs and prototypes were presented in a joint community event with all 3rd, 4th, and 5th grade students at the Denver Aquarium as students shared their learnings about why people should care about the ocean, and how scientists were sharing this ocean knowledge. After spending the past six months in Finland learning about inquiry, STEM, and the overall education system, the future of Project ROV began to take shape. In presenting to schools and educational communities around Finland, there was high interest in building ROVs. In conjunction with Niko Nappu (HiLIFE research stations) and Kimmo Karell (Itäkeskus primary school), students in Germany, Finland, and the USA will continue to explore, collaborate, and share scientific research and ROV design. Building a SeaPerch ROV in US (photo: Andrea Schmuttermair and Ocean First Education). Girls can do it (photo: Andrea Schmuttermair and Ocean First Education). 3D.modeling (photo: Andrea Schmuttermair and Ocean First Education). Wires and computers (photo: Andrea Schmuttermair and Ocean First Education). Sink test (photo: Andrea Schmuttermair and Ocean First Education). Pool test (photo: Andrea Schmuttermair and Ocean First Education ). SeaPerch in action (photo: Caine Delacy, Ocean First Education). This video was made by one of my students as a persuasive writing assignment. After building our ROVs, we wrote to GoPro to request a donation of another GoPro camera to attach to our ROVs. 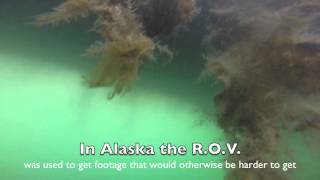 It used pictures and footage from the GoPro camera when it was attached to the ROV that was deployed in Alaska while I was a NOAA Teacher at Sea. Visiting Tvärminne Zoological Station in May 2017. Persons from left to right: Niko Nappu, Marko Reinikainen (station director) and Andrea Schmuttermair (photo: Kimmo Karell). Taking a closer look on the ANK-ROV project in Itäkeskus primary school with some students. The ROV has not been in the water yet, but the students are already wondering hot to add a robotic arm to the ROV. Students and the ANK-ROV in Itäkeskus primary school in January 2018 (Kimmo Karell in the midlle). ANK-ROV on the right. This is the prototype of a ROV which is developed in the project and it could serve as a model for other school projects. My dream is to bring together underwater exploration, STEM, and ROVs to inspire students to engage in real-world, self-designed inquiry projects that they will share with the world. Previous PostWhat happens under the waves? So nice to see this project is still going on strong! Of course it is! Feedback and collaborators are welcome. We’ll present the project at ITK 2018 in May. Are you coming? What happens under the waves?